Why buy fake money for your kids when you can print out pretend dollar bills and coins for free? 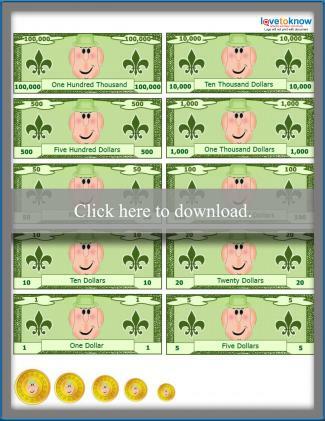 Printable play money helps kids from toddlers through the pre-teen years learn about all aspects of money and banking. Click on your favorite novelty money then download and print consulting the Adobe Guide for any issues. If you're looking for pretend money that looks like the real thing, this novelty money set is perfect. Each dollar bill is green and features the likeness of a U.S. President along with an American flag design and the silhouette of a bird carrying a branch. Each bill has the dollar amount written numerically and in words. Denominations include $1, $5, $10, $20, $50, $100, $500, $1000, $5000, and $10,000. Realistic play money is great for older kids because it looks more mature. Younger kids will enjoy pretending to shop or bank with fun printable dollars and coins. This play money set includes five coins of different sizes and ten bills ranging from $1 to $100,000. The light green bills and gold coins feature a cartoon man's face. Each bill has the dollar amount written numerically and in words. 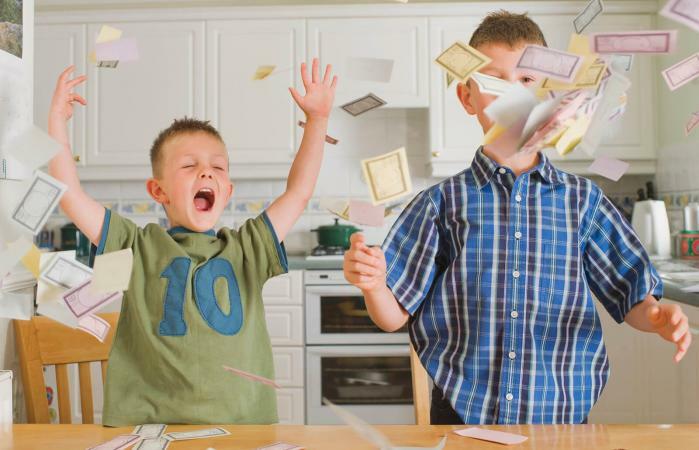 Money games for kids are fun and useful at every age. As kids grow up they can learn about different aspects of the American monetary system. Whether you're teaching at home or in a classroom, any activity involving play money becomes educational. At the basic level, you teach kids what each bill or coin represents and teach kids how to count money. 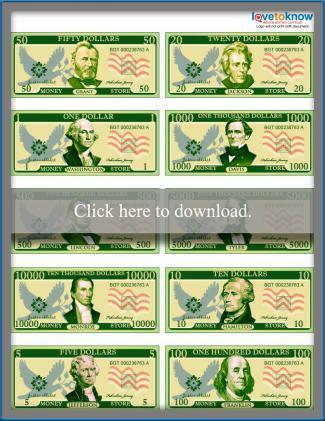 Print off money worksheets for children that test their knowledge of real money values. Give each child some play money so they can solve money math problems with tangible counters. Contrast and compare the pretend money to real dollars and coins to learn the components of genuine money. It's never too early to start lessons about saving money that include information about spending versus saving. Kids can use play money to show how much they should save if they receive money for birthdays or other holidays. Set up a classroom rewards system using novelty money where kids can earn different amounts for things like turning in homework on time or helping out a friend in need. When you teach banking to kindergarteners, it includes simple math concepts such as addition and subtraction. Use the pretend money to give kids a visual of the concept they're learning. Toddlers and preschoolers enjoy activities that mimic real life and what they see adults doing. Keep some play money in their toy area and give them the freedom to get creative with it. Purchase a kid's wallet where your child can store their fake dollars and coins. They'll feel a sense of ownership and be able to roleplay shopping games. Play a prank on family members by replacing some of their actual dollars with fake ones and see how long it takes them to notice. Common toddler activities involving money include playing store as a shop owner or a grocery shopper and filling up a piggy bank. Give out play money sets for holidays such as Easter or Halloween as an alternative to candy. Use a toy cash register stocked with play money to make role-playing games more realistic. Play money is not built to last, so printing off your own is a cheap and easy alternative to buying these tiny bits of paper. There are endless activities kids of all ages can enjoy with pretend money and use to learn valuable life lessons.